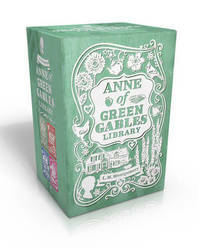 Treasure the imaginative world of Anne Shirley with the first four artfully packaged books in the Anne of Green Gables series, now available as a collectible boxed set. Red-headed, big-hearted Anne Shirley is one of literature's most classic and beloved characters, and this four-book boxed set is the perfect way to cherish her adventures and her legacy. Each of the four included books features an artistically crafted cover, making this boxed set a wonderful gift and keepsake. "Anne of Green Gables" introduces orphan Anne Shirley as she first comes to Marilla and Matthew's home on Prince Edward Island. "Anne of Avonlea" chronicles Anne's misadventures as Avonlea's schoolteacher. "Anne of the Island" follows Anne as she sets out for Redmond College, and "Anne's House of Dreams" tells the story of Anne and Gilbert's new life together in Four Winds Harbor.